What are the stressors in an indoor environment for cats? Multi-cat households place cats in an environment where they are required to live with feline strangers, initially. Cats that sleep together, mutually groom and seek each other’s companionship are obviously not stressed by each other’s company. However, relationships like these take time to develop. Aggression between feline housemates is obvious when it results in screams, torn ears and flying balls of fur. Introduce cats slowly, and give them plenty of space, along with abundant resources. Otherwise, unchecked aggression can result in a chronic, low-grade tension, leading to stress-related behaviors like obsessive grooming, overeating, urine marking and feline lower urinary tract inflammation. Visualizing a stray cat or neighbor cat through the window can also cause some of these behaviors. Cats are becoming increasingly popular pets, in part because they are relatively independent and are good at taking care of their own needs. For a busy household, a cat easily fits the bill for a low maintenance pet. People do, however, want to have an affectionate companion. By nature, most cats prefer frequent, low-intensity encounters with their humans, like a rub on the leg, a jump on the lap or a flop across the computer keyboard. Humans, however, prefer less frequent, high-intensity interaction. We like to pick cats up, hug them and kiss them. This can create stress for cats—and their primary strategy for dealing with it is to run away. It is important to socialize kittens from a young age to the way humans interact (for example, holding, hugging or kissing). If this is not possible—either because the cat is older or simply refuses this type interaction despite attempts at gentle socialization—it is important to respect the cat’s natural behavior and avoid highly restrictive handling. Instead, we can have short periods of greeting and petting and use our voices to interact. Cats are naturally inquisitive, active and attuned to their environment. By keeping cats indoors, we inadvertently diminish their options in regard to exploration, climbing, hunting and responding to an ever-changing environment. Allowing cats outdoors is not a good option in areas of high-density housing, cars and predators. Instead, creating an enriched indoor environment that allows cats to continue to practice these behaviors is recommended. 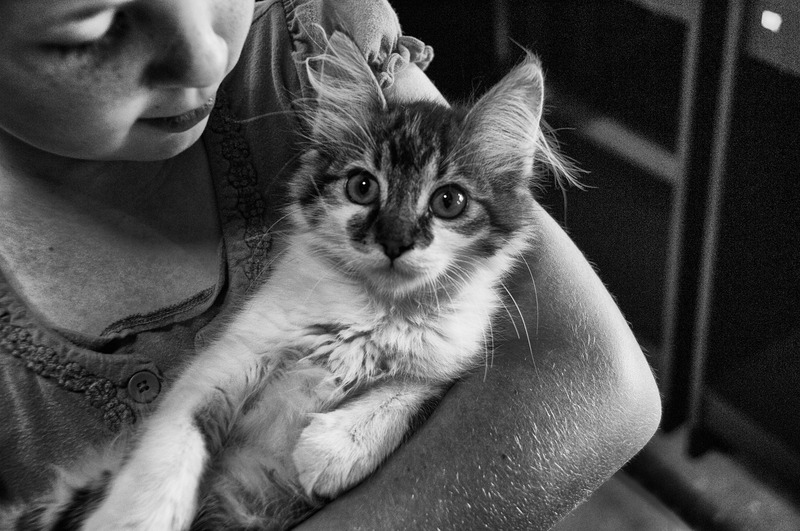 How can we minimize stress in the feline home? Vertical space is a wonderful way to enhance a cat’s environment. Cats love to observe from on high knowing they will not be disturbed. Cat trees can also double as areas to scratch and mark with their claws. Puzzle feeders require action on the cat’s part to eat. These items can be purchased at any pet supply store, but are also easy to make at home. To create a homemade food puzzle, simply cut small holes into a small cardboard box or plastic bottle and fill it with your cat’s favorite food or treats. Hiding treats around the house and using a laser to guide the cat to a treat are also fun and interactive games. Interactive play multiple times a day with a feather toy or ball will provide short bursts of activity that simulate the natural behavior of a cat observing and hunting prey. During non-interactive periods, a simple box can be thoroughly entertaining and provides a nice place to sleep. Toys should be rotated regularly to maintain interest. Privacy, choice and a hygienic environment are also important factors to consider. All cats have territories within the home and need places they can hide, both high and low. Each cat also needs his/her own set of resources away from the other cats in the home. This means his/her own litter box, feeding station, water station and one-on-one time with their favorite human. These should be provided even if the cats seem to use each other’s resources. Remember that cats should be left alone when they are resting, as this is when they are most vulnerable. Litter boxes should be provided for each cat and in different locations. Most cats prefer to have the litter box kept in an area away from their feeding and water station. Cats also like quiet privacy to eliminate. This is another time when they are quite vulnerable. If the litter box is located in another cat’s territory or in a noisy or a busy location, or if it is dirty, the cat will be less willing to use it. A good rule to follow is one litter box per cat in the home, plus AT LEAST one extra. For obviously fearful or stressed cats, a feline pheromone diffuser may be beneficial. Many cats adapt very well to the indoor life that we ask them to live. If we are willing to understand normal cat behavior and provide a few key ingredients, we can go a long way toward keeping our indoor cats stress-free and healthy. Feel free to contact us if you have any questions about creating the purr-fect home for your kitty!